Bhushan, right, receiving the awardOn August 29 Professor Bharat Bhushan was recognized with the American Society of Mechanical Engineers’ (ASME) Distinguished Speaker Award. 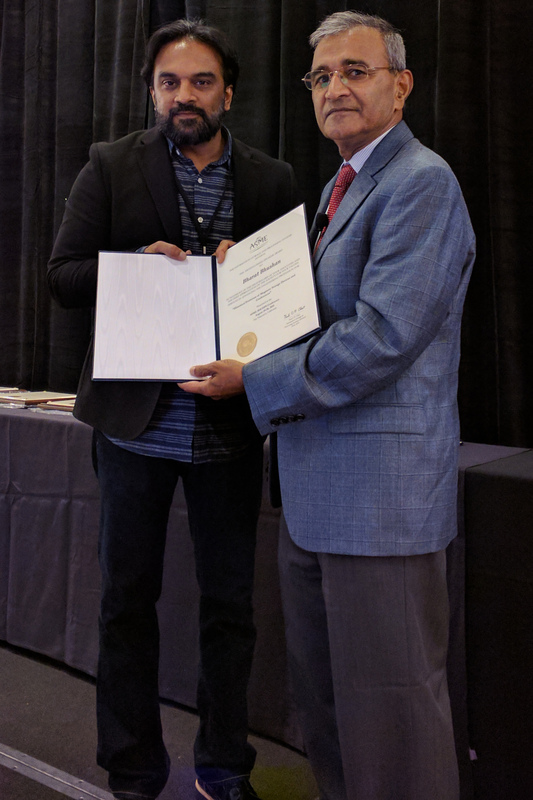 The honor was given during Bhushan’s invited lecture at the 27th ASME Annual Conference on Information Storage and Processing Systems and Micromechatronics for Information and Precision Equipment, held in San Francisco, California. The acknowledgment recognizes his valued services in advancing the engineering profession and pioneering contributions and leadership in tribology and the mechanics of magnetic storage devices industry. “Since the late 1970s, tribology of head-medium interface in magnetic storage devices has been considered a limiting technology for ever increasing recording densities," said Bhushan. "I am pleased to have made some contributions in the advancement of the tribology of magnetic recording field." In addition to being an Ohio Eminent Scholar and holding the Howard D. Winbigler Professorship, Bhushan directs the Nanoprobe Laboratory for Bio/Nanotechnology and Biomimetics.